As our most recent employee norms study showed, only about half of all employees are actively engaged in and committed to their jobs. Most employees have ‘checked out’. The reality is that organizations that do a better job of engaging their employees are more productive and therefore more successful and one of the simplest and most effective ways to engage people is to demonstrate and acknowledge how others are contributing to their organizations success. When employees see that their effort matters, they are more likely to be inspired to do a good job. If you respond to high producing loyal employees with more work longer hours and no financial compensation you employees could burn out and lose faith in you and your organization. Provide more positive than negative feedback. Employees need to know what they can do to improve any aspect of their work. Be aware of whether you preceed positive feedback with negative criticism. Employees generally decline to participate in negative feedback and as they reflect or worse ruminate, a heightened sense of disengagement may follow. 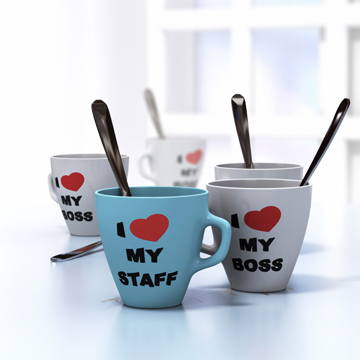 Show that you trust and appreciate your employees. Its not surprising that employees become increasingly dissatisfied when their desire to be acknowledged becomes a lower priority than the work itself. A thank you goes along way. Leaders who operate from a ‘me’ rather than a ‘we’ perspective flatten their organization. These people may take credit for another employees idea or they mail fail to have their employee’s back. Great leaders surround themselves with people who possess skills they do not have elevating the performance of the whole team. No matter how high tech our workplaces become, your success is driven by people who are motivated to do a good job and succeed. A ‘do this, get paid’ arrangement is a fact employees inherently understand which is why it is so crucial to communicate and connect with employees on a truly authentic level. It is important to remember that we are all unique and human.